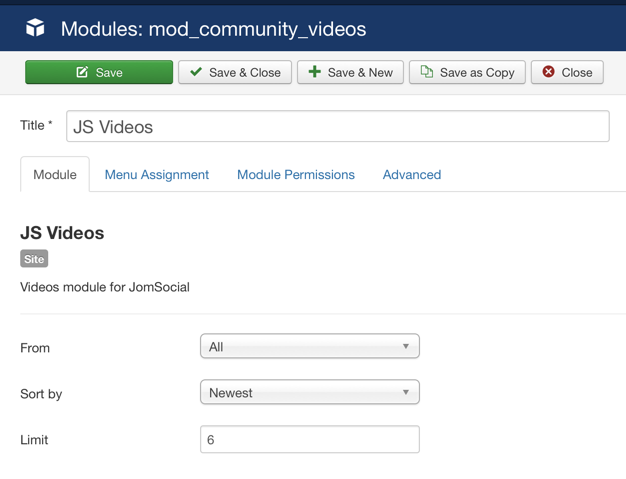 Module to show latest videos in the community. From - Select the source of videos. All - Display all videos logged in user have permission to see. Users only - Display all videos created by other users, as long as logged in user have permission to see them. Groups only - Display all videos from groups that logged in user have permission to see. Events only - Display all videos from events that logged in user have permission to see. Sort by - Select the sorting option. Newest - Sort by date of creation. Popular - Sort by the number of views. Featured - Show only featured videos.